I've started writing the db tables to store all the NPCs as well as the code to load and display them. 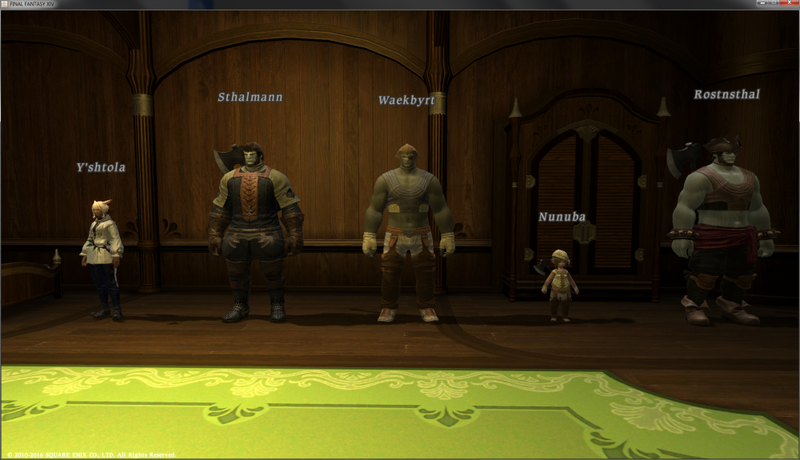 There are a lot of NPCs in FFXIV but luckily the client has an internal table of all of them. Well... kinda. There are three main sheets that have to deal with NPCs: actorClass, actorGraphic, and xtx/displayName. ActorClass and ActorGraphic both share the same ids, and are linked together 1-1. I have a suspicion that this file is duplicated on the server but contains a lot more info (position, animation, etc) because all the fields are empty except for "displayName id". The displayName id links to xtx/displayName which contains the name of every NPC in the game. ActorGraphic has all the model, head, armor, and weapon Ids needed to set the appearance. With this data, the really hard part; name and appearance is already done! Also because the appearance data is the same as the player's appearance data (they are both character actors), you can set characters to look like NPCs! Note: an NPC can be a static talkable one OR a monster. After getting the data uploaded and the NPC's loading I worked on the code that would send the correct actor packets to the clients so it would appear to players. This was pretty quick after some bugfixing due to player actors already using this same system for multiplayer. I still need to implement some NPC specific packets relating to events before it can be finished, but below is some actors I spawned. Their names are grey because they have no health state (so technically "dead") and no "talkEvent" handler set which would have made their names green like most NPCs. PS: Just realized comments were disabled >.<. Enabled em on all pages. Jorge22 January, 2016Huh, so that makes XIV more similar to XI than I imagined if the client also has a table of pretty much every non-player in the game. Would have figured with how unoptimized the game (and its server) was, that it'd be fetching all that kind of information from the server directly. Curious if that means not being able to have custom actors that are not part of the table though, To my recollection, XI had to have its list (which was on a per-zone basis) updated any time you wanted to add a new entity to a location, but there was a catch-all Moogle actor they could use and change the appearance of. Ioncannon22 January, 2016@Jorge, thing is the game doesn't use these sheets to my knowledge. The packets send the whole appearance data! Everything is customizable. caelumsixsmith22 January, 2016Oh, comments!! Very nie, ty! I know nothing of programming, but been following the server progress for some time now. I'm very excited to see it up and running and if there's something you need on the PR side of things (that doesn't involve dealing with lawyers), you can certainly count on me. Let me with you the best and congrats on all the progress you've made! Cheers! Keeper of the Moon saved to Version 1.0 save slot 123 February, 2016You are beautiful and wonderful for working on this. 1.0 is my life. Nothing has ever evoked such magic and life into my soul. I have searched everywhere in 2.0 and 3.0+ looking and testing lighting situations, armor set ups etc trying to find even a fragment of magic leftover from 1.0. Nothing's every moved me emotionally once except for the content of Burning Coil raids. Even looking at a single rock on the ground from screencaps of my 1.0 days wrecks me. 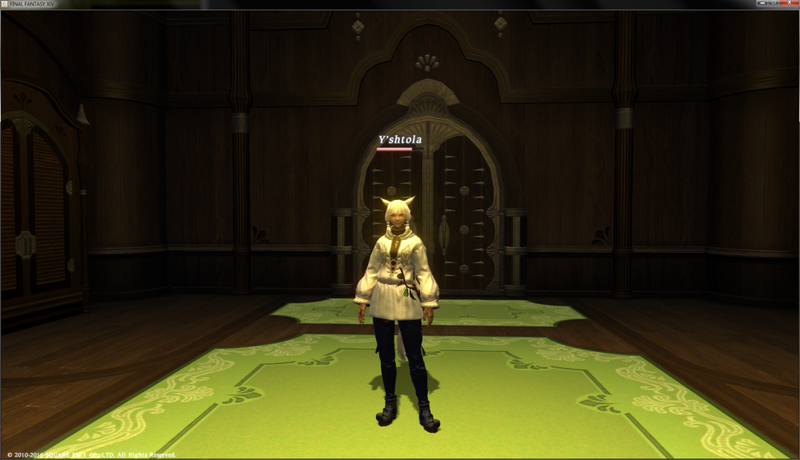 My character that SE brought over to 2.0 was like a doppelganger with no soul or mind. No life. Dead on arrival. Louisoix should have let her burn in flames, because that's not her in that desaturated, cardboard textured body in 2.0+ Thank you for your amazing work here. You've returned the magic to the world. Watching your progress videos and reading everything you are my hero. You've brought the possibility of my 1.0 character back to life. To hear her laughter and happiness again... T_T I would give anything. I get to meet Y'shtola again for the first time again. <3 Thank you with all my soul aether. RavenTsun28 May, 2016You've gotten further than anybody ever has when it comes to resurrecting FFXIV 1.0; a feat I truly hope will be completed some day. It's a shame that Square Enix essentially tossed everything from 1.0 in the trash can, as I feel that every fan of FFXIV and Final Fantasy in general should have the chance to experience 1.0's story and world before the events that resulted in A Realm Reborn. Wishing you the best of luck in this endeavor. If you ever need help, I'm more than willing to do anything to make sure this project succeeds- and I can guarantee everybody else in the comments would offer their help as well.